Where in the world is the best place to be a driver? And where is it...less enjoyable to be behind the wheel? This week, Waze released its second annual Driver Satisfaction Index, which analyzes the driving experience of millions of monthly active Waze users in 38 countries and 235 metros to create a single numeric score, from satisfying (10) to miserable (1). While Waze has more than 65 million monthly active users globally in 185 countries, the study focuses on countries and metros with more than 20,000+ monthly active users to ensure data accuracy and fair market comparisons. Rather than focusing only on a single measurable factor, the Waze Driver Satisfaction Index takes into account six attributes – both qualitative and quantitative – to give you an unbeatable look at what it’s like to drive in a variety of cities and countries around the world. Now for the big reveal: who are our country victors? For the second consecutive year, the most satisfying place in the world to drive is the Netherlands, thanks to its smooth traffic conditions and solid road quality and infrastructure. Rounding out the top five are France, the United States, the Czech Republic, and Sweden. And where is it tough to be a driver? El Salvador, the Philippines, Guatemala, Panama, and Indonesia are the least satisfying places to drive globally, largely due to intense traffic and low Wazeyness and socio-economic factors. As for rankings by metro, France dominated with Valence taking the #1 spot for most satisfying driving experience, due to good-quality roads, low gas prices and traffic, and a helpful Waze community; 9 other French metros also snagged spots in the top ten. Last year’s winner, Greensboro, NC, USA, fell to #5 for 2016, tying with Avignon, France. On the other end of the spectrum, Cebu, Philippines, ranked as least satisfying, or the worst place in the world to be a driver. Following Cebu are Bogor, Indonesia; San Salvador, El Salvador; Denpasa, Indonesia; and Bandung, Indonesia. 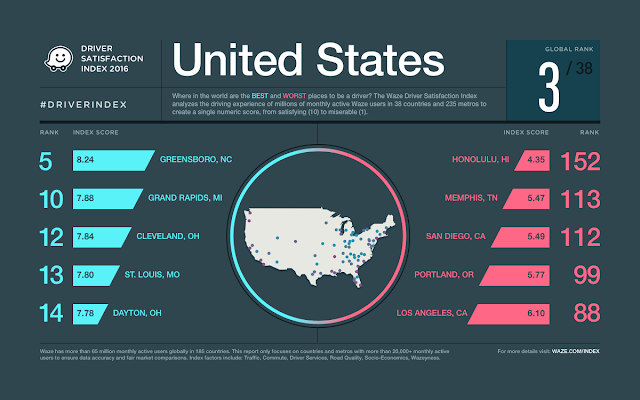 For the second year in a row, Greensboro, NC topped the list as the most satisfying drive in the US (#5 globally) and Honolulu, HI was found to have the least satisfying drive in the States (#152 globally). Want more? Explore the world rankings on our interactive map at waze.com/driverindex and click on different circles to see how countries and metros rank on the global index. You can download our full data report here.